"Onions, garlic, and sesame seeds are sauteed in wine, then added to pinto beans for an adult hummus! Serve with vegetables or chips." Combine water and pinto beans in a saucepan; bring to a boil and cook for 2 minutes. Cover saucepan and remove from heat; let sit, at least 1 hour. Bring water back to a boil, reduce heat to medium-low, and simmer until beans are tender, about 45 minutes. Mix onions, red wine, sesame seeds, and garlic in a small saucepan; bring to a boil. Reduce heat to medium-low and simmer, stirring occasionally, until wine has evaporated, 5 to 10 minutes. 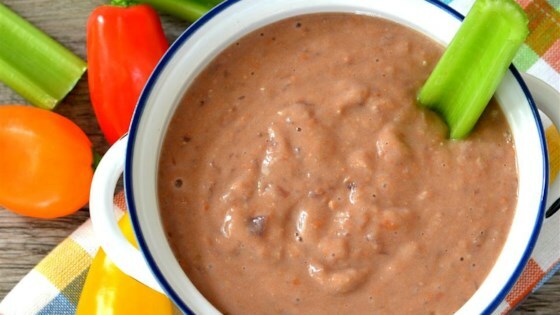 Blend bean-water mixture in a blender until smooth; add onion mixture and blend until smooth. See how easy it is to make your own hummus in a blender. Additional water may be added while blending to get a smooth consistency for hummus. If this is your meal, this serves a few. But if this is an appetizer, more servings can be had.